After having roamed the Zweisimmen area for most of the day it was time for us to catch our train (MOB/GoldenPass line) for our 2 hour journey back to Montreux. With a heavy heart we left that little paradize. We really wanted to stay longer in that charming, peaceful and soul-uplifting place! Anyhow, we had to go back home so we bravely got on the train and sat patiently in the air-conditioned and comfortably furnished passenger compartment. 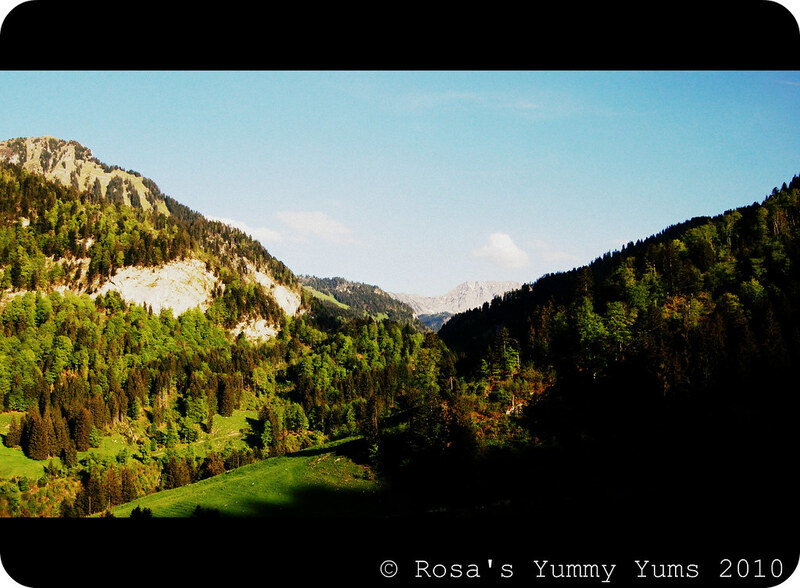 Then, the train started to move, climb up on the side of the Rinderberg mountain and head out of the Simmental Valley in the direction of Gstaad, Château d'Oex, Montbovon and Montreux. So, for the next two hours we went through three magnificent cantons (Bern, Fribourg - Haute Gruyère - and Vaud - Pays d'Enhaut), many fabulous places and villages (Obersimmental, Pays d'Enhaut - Saaneenland, Montreux region). Ecstatic! 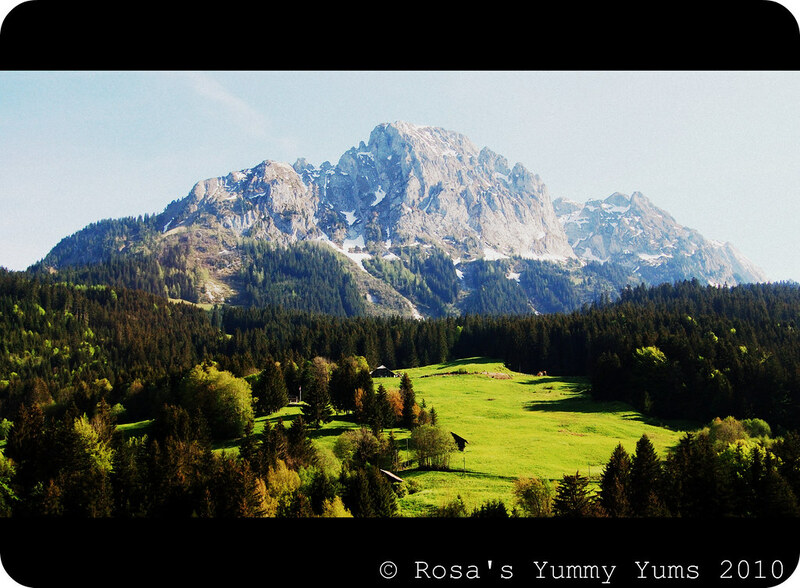 As the landscapes are stunning and the views out of the window are breathtaking, I took a few shots while sitting in the train. Thankfully they turned out great, so I hope you'll enjoy them. 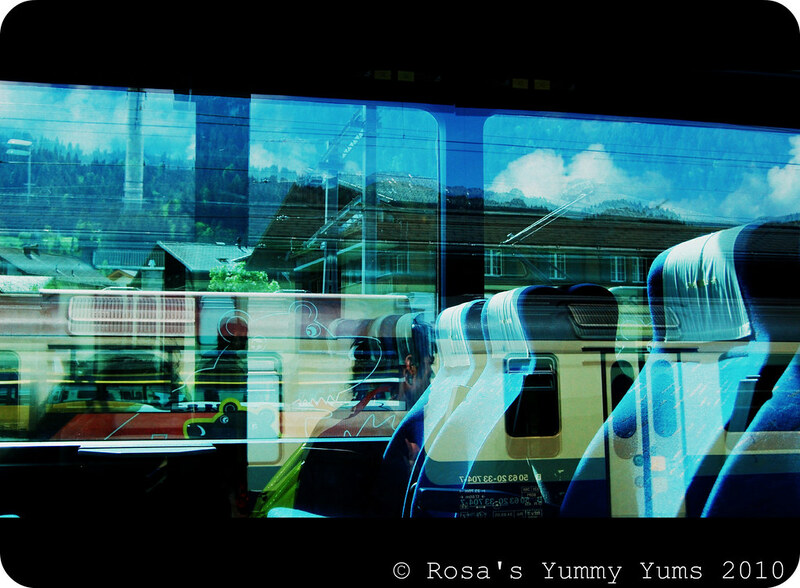 Thanks for taking the time to show your trip to and from Zeismmen...so idyllic. Love the pictures.I took a virtual trip with you. This mini journey I've been following has truly been a wonderful delight. Did I mention...that after the passion I have for food...the world of travel is very close to my spirit which has lead me to appreciate adventures like yours. What a trip and how amazing moments you had!! amazing scenery! you capture it perfectly. I especially enjoyed the first two pictures, what a great eye you have. I really love your pics! these are full of freshness and energetic colour! What an amazing adventure you have been taking us through Rosa! 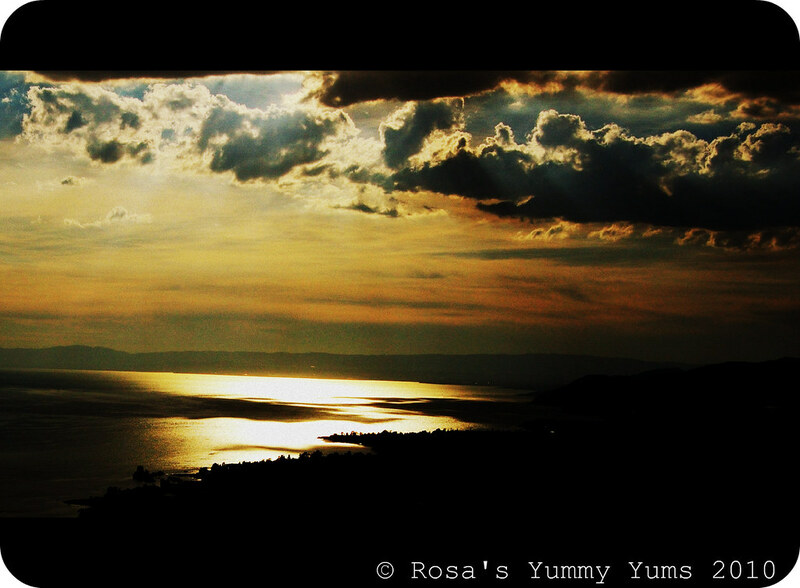 oh Rosa, you have been very lucky to see such a breathtaking sunset ! Beautiful scenery ... what a great holiday trip. Okay so this is where I meant to say, beautiful pictures, But the cats are pretty cute too! 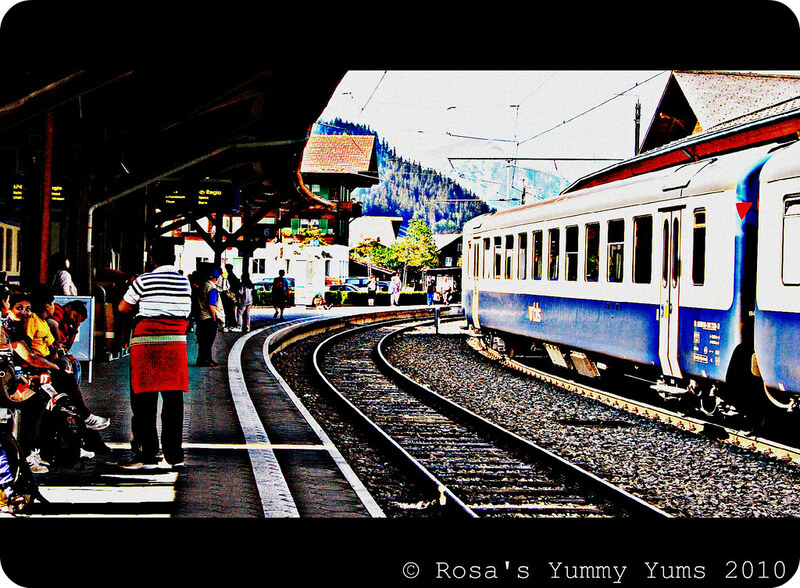 The train station pictures are amazing! Merci pour cette belle balade virtuelle, j'ai presque crue que j'etais dans le MOB ! J'aime beaucoup celle où tu es dans le train, elle est tellement jolie, bravo! Ces photos sont vraiment sublimes! Franchement Rosa, je suis impressionnée, charmée et j'ai envie de revenir regarder tout ça de plus près. You convinced me again, I need to make a tour with you there! Wonderful photos! Lovely vacation Rosa! Thanks for sharing your beautiful pictures! What beautiful pictures! This is my first visit to your website. I have to come back. There are so many great recipes, and I've only looked through the dessert section! Le plaisir est partagé. Les paysages sont magnifiques ! Rosa, you have an outstanding artistic perspective. GREAT shots. 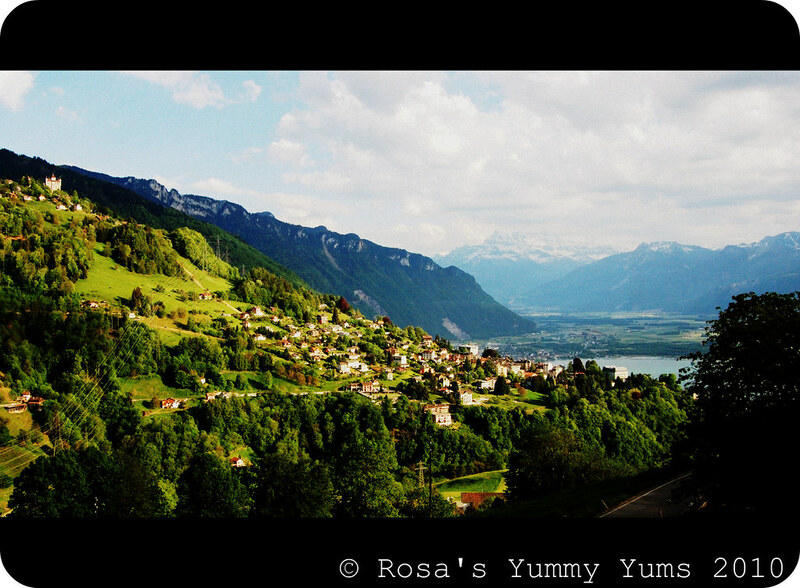 I miss the Alps. 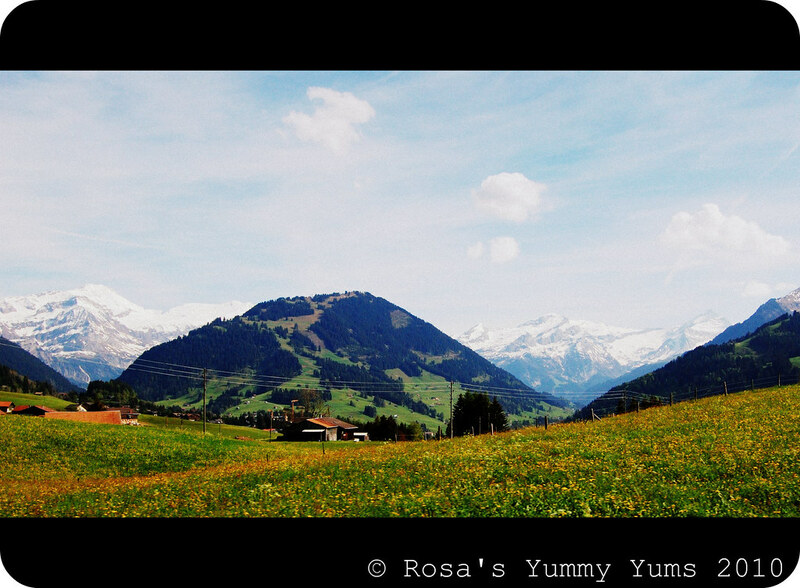 OMG Rosa, those photos are absolutely breathtaking! It's like heaven! If I'm in your shoe I wanted to stay longer too! That is such a fantastic place to visit. I'll keep this in mind. Thanks for sharing. Hope you're having a wonderful day, dear. I've had so much pleasure taking a virtual vacation with you! 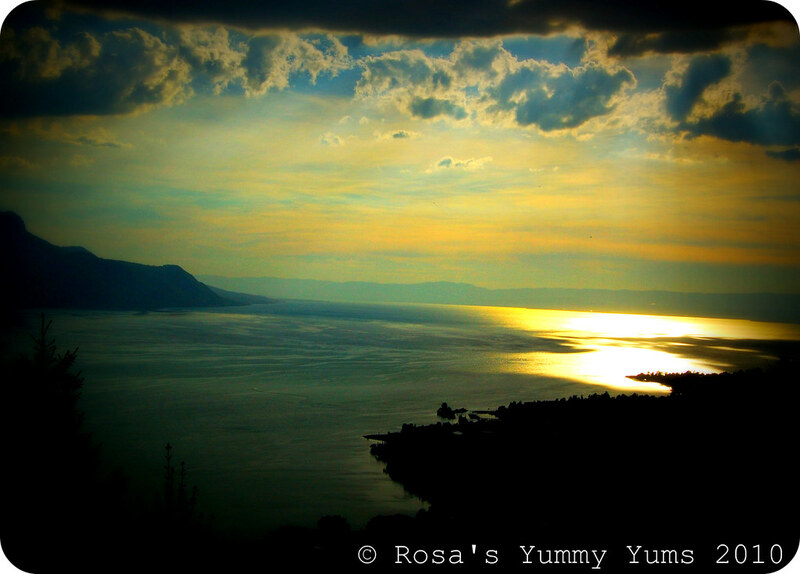 The sunset photos are absolutely breath-taking, Rosa. Love the train and water photos here! So pretty. Must have been hard to come home! Your photos always amaze me. They are just breathtaking! Oh, these are just beautiful! And those train shots- fun! Merci pour ces superbes photos d'un magnifique voyage ! Merci ! La deuxième est incroyablement belle ! Bon we Rosa ! Merci pour cette fin de voyage en ta compagnie Rosa. J'ai aime du debut a la fin. Great pictures - they look really dramatic. The scenery is so beautiful. 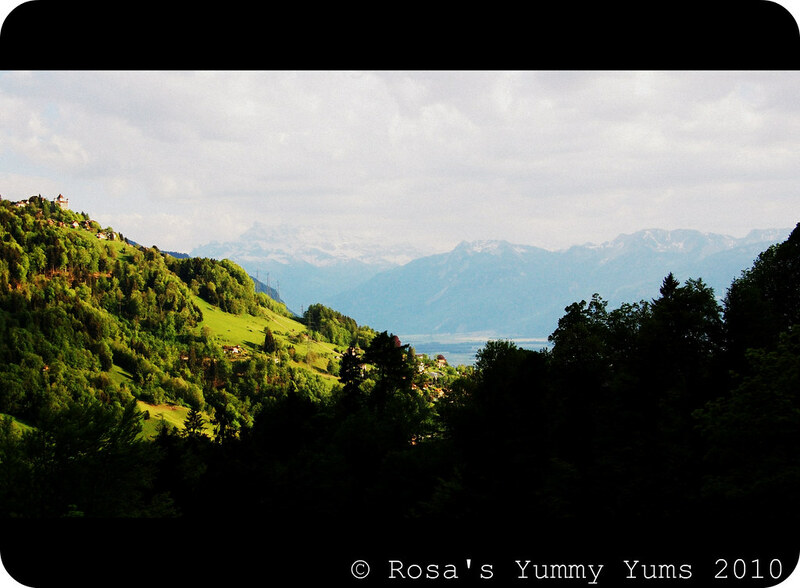 I love the alps and valleys. These photos are amazing, I was thinking they would be incredible screen savers. Thanks so much for the wonderful recap. those photos of the mountain lake are soooo gorgeous!!! If I do not get to visit these places in this life time I would have an unfulfilled life. I will be dreaming of these scenes today. Drinking them all in to the brim. Your photography is gorgeous. Beautiful captures!